Born in 1935 in Kanda, a central area of Tokyo, Japan. After working as an assigned photographer to the magazine Josei-Jisin and the publishing department of the Asahi Shinbun, became a free-lance photographer in 1966. The Budding Photographer Prize of the Japanese Photography Critics Society in 1965. The Kodansha Award for Cluture in Publishing in 1978. The Annual Award of the Japan Professional Photographers Society in 1980. The Budding Photographer Art Prize of the Minister of Education, Science and Culture in 1981. 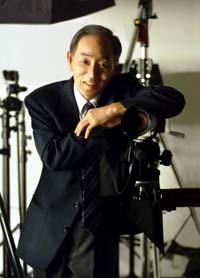 The Master Honor of the 150th Anniversary of Photography in Japan in 1989. The Advanced Cultural Activity Award of the Japanese Photography Society in 1995. Tomiyama Haruo "Our Day" in the International Center of Photography (ICP) New York in 1978. The Tomiyama Haruo Photographic Exhibition for the 50th Anniversary of the Chinese Revolution at the Beijing Art Museum in 1999.